So after all that rain, thunder & lightning...we got cooler temps, the weather is so weird. 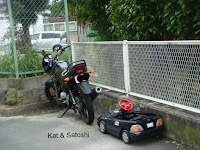 Yesterday Satoshi had the day off and we had some errands to run. I got to ride the trains during rush hour, which is NOT FUN. Jammed into the train car with someone elbow in my back, another person leaning on me! 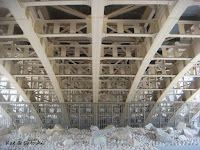 And no air conditioner...did someone say "sauna"?! After we got everything done, lunch was a little late, so we popped into this place...Curry-ya Sun. There weren't many seats but they serve all sorts of curries. 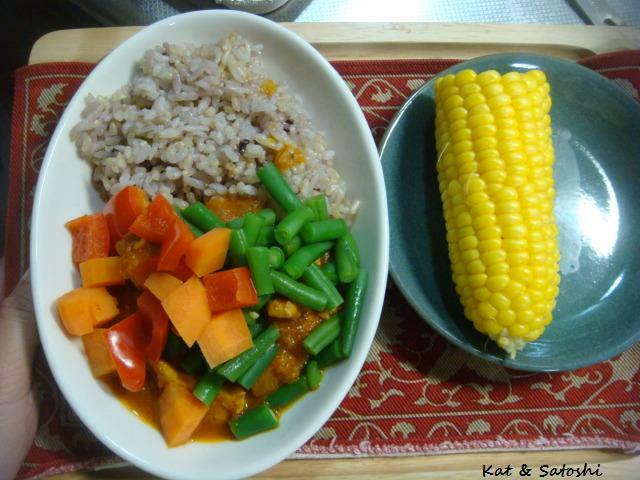 Satoshi went with the vegetable curry. This came with a large salad and a little yogurt for dessert...750 yen. 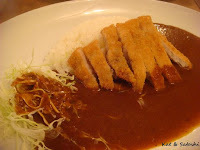 I went with the Kirishima pork cutlet curry. This also came with a large salad and a little yogurt...950 yen. The pork was tender and the curry was spicy but not "burn your mouth" level. On the plus side is that they don't allow smoking during the lunch hour...whoo! *days off not determined, call before going. Even if we've not been "declared" to be in rainy season by the weather dude, I swear we are. Yesterday, it was so humid and then we had a thunder AND lightning show plus a huge downpour TWICE! I even saw a bolt of lightning above the condo across of ours...I'm glad I got my walk and grocery shopping in before all the excitement happened. I guess I should be thankful, there were other areas of Japan that had hail?! 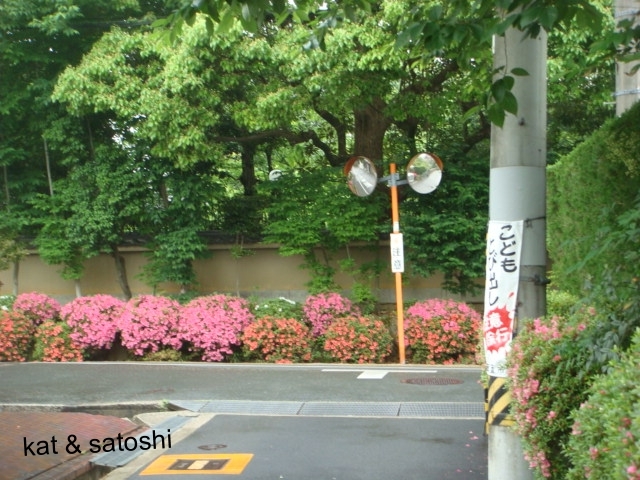 Anyway...on one of my walks last week, it was drizzling but the azaleas were in full bloom and very pretty. Then on another walk, I walked along the Ookawa towards Nakanoshima. I noticed this winding ramp. 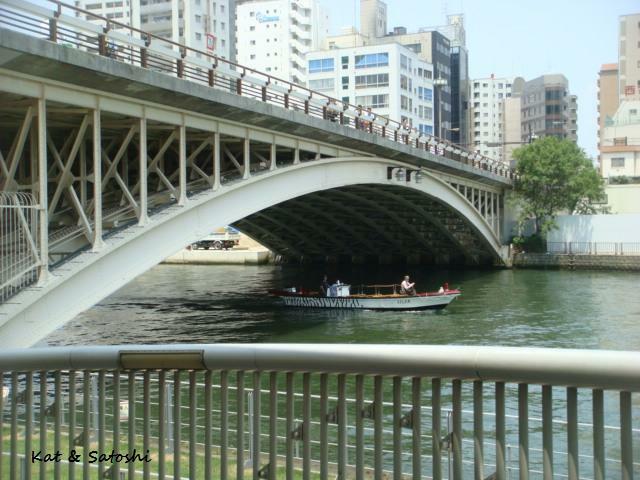 It turns out this ramp is great for bicycles & wheelchairs to get on and off Nakanoshima. As I was making my way down the winding ramp, I noticed this boat with 1 passenger and a driver. The guy riding was filming something. 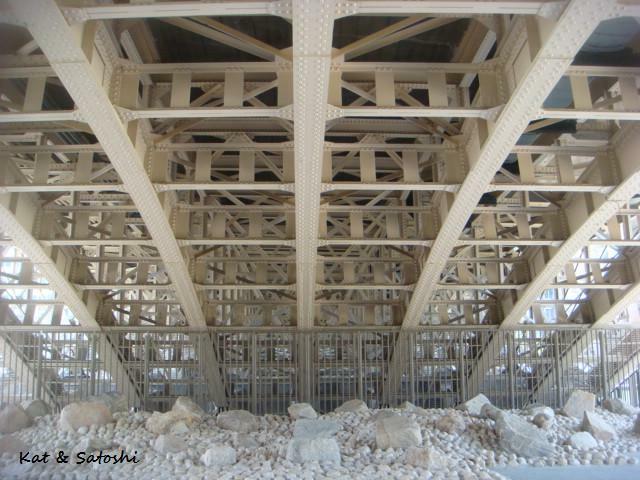 This was the bridge from the underneath. A little further down was the Nakanoshima rose garden. 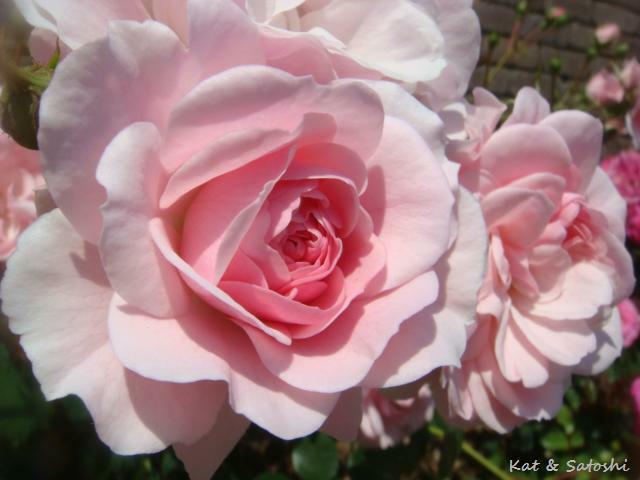 We've gone here in the past and enjoyed the roses. 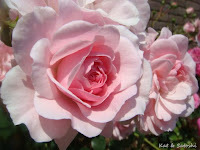 This year I went a little late so the roses seem to have been past their prime. Also, it was so hot on this day that most of the flowers looked limp. 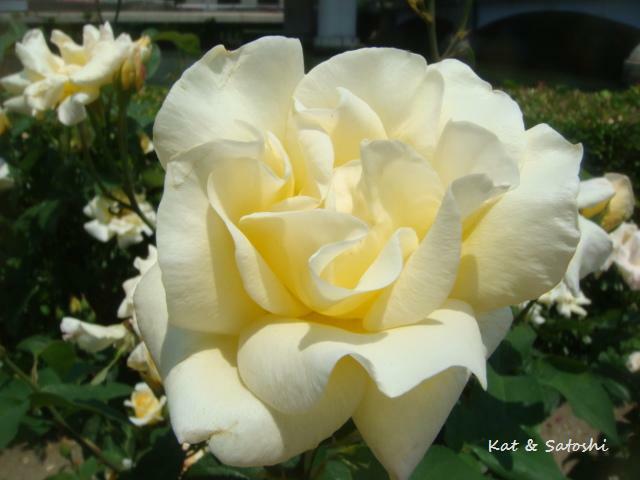 I loved the names of these roses...Gina Lollobrigida. 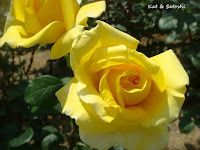 And this one was Yellow Queen Elizabeth. Met up with my friend Hiromi again for some walking, lunching and chatting. 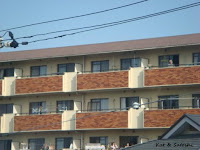 This time we headed to Kamizono in Minoo. 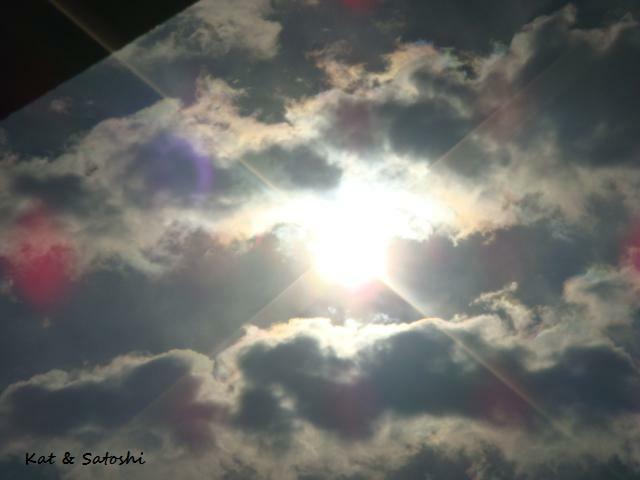 The weather was sunny but oh so humid! After lunch we were in the mood for something sweet, but our first choice was a bust, so we ended up at Hiro Coffee. I had the blueberry fromage which was like blueberry cheesecake. Despite the heat, we both had a great time. 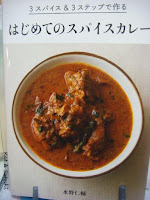 Okay, so I think I have curry on my brain now because within days, I tried another curry from this cookbook. This one was a little more intense--taking up more time to make, but the end result was really ono (delicious)! 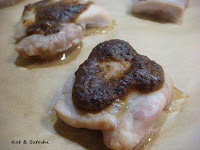 Marinate your pork in umeshu, shoyu & pepper for 2 hours or longer, mixing every so often. After grating garlic and ginger, add 1/2 cup water, mix and set aside. In a heated pan, add the oil and onions, saute on high for about 10 minutes (or longer) turning it a dark brown. Add the ginger garlic mixture and cook for about 2 minutes to let liquid evaporate. Add the 3 spices, one by one mixing each one well into the sauce before adding the next. Add the ground black sesame. When the sauce becomes thick almost like a paste, add the hot water, mixing it as you add the water. Add the marinated pork and marinade, and add the daikon, turn heat to a low-medium and cover. Cook for 1 hour then take off cover and cook for another 30 minutes. NOTES: this took some pre-planning and time cooking but it was delicious! It reminded me of a slightly spicy pot roast with some Asian flair to it. 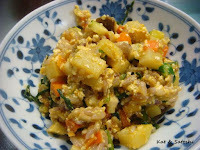 I served this with rice, goya, red bell pepper & carrots and would make this again. 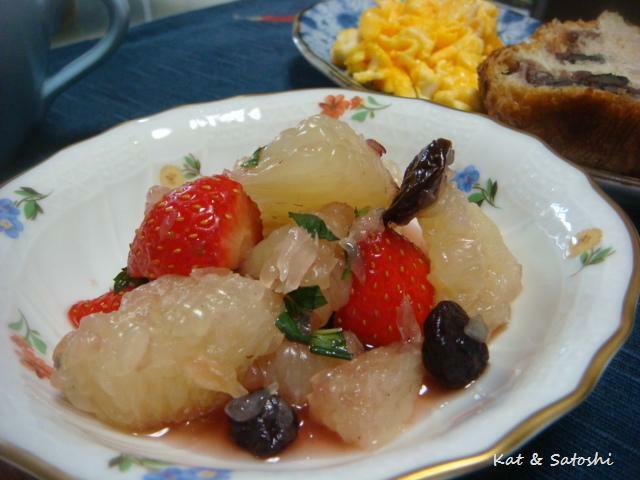 *if you can't find umeshu (apricot wine) in your area, I would use sherry or a little port. Bing cherries have hit our markets and their prices aren't too friendly...I got lucky though and snagged some at the market when they were on special. I also added some 60% chocolate chips to each before baking. I'm always trying to find a way to get away from using the pre-made curry roux because most of them have stuff like lard and lots of salt, stuff we really shouldn't be eating, even if it tastes fabulous and it is convenient to use. 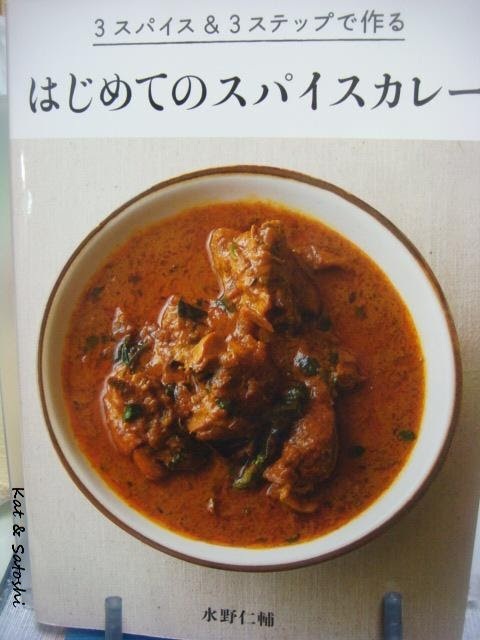 Anyway...this book called "Hajimete no spice curry" (literally first spice curry) by Mizuno Jinsuke, is pretty good. Most of his recipes in this book use 3 basic steps (cut, saute, simmer) and 3 spices (turmeric, cayenne & coriander). I tried his basic chicken curry adapting things here and there. To the grated garlic & ginger add the 50 mililiters of water, stir well, and set aside (this is so that you won't have clumps of ginger and garlic in your sauce). Massage 1/2 teaspoon salt and some pepper to chicken and set aside. Then for the next 3-4 minutes mix with a wooden spoon, making sure the sides don't burn. Add the ginger, garlic mixture to the onion, mix well. After 20-30 seconds, there should be steam rising, cook for 1-2 minutes to let some liquid evaporate. Add the diced tomato, turn the heat slightly up. Add the spices (turmeric, cayenne, coriander) in that order and mix in well before adding the next. It should look quite thick at this point. 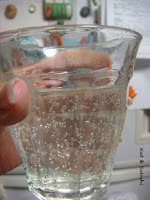 Turn the heat to high and add the hot water slowly to the mixture, bring to a slight boil. Add chicken and bring back to a slight boil. 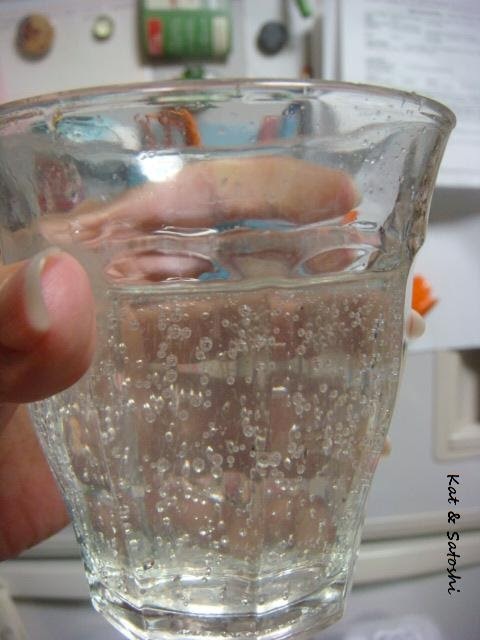 Turn heat to a simmer and let bubble for 30 minutes. If after 30 minutes the curry is still watery, let simmer a little longer. The consistency should be a thick stew. NOTES: Even though this was technically "3-steps", it did take some time to make. But, I liked the fact that I could control the salt and oil. I liked the heat from this and the taste was like some Indian curries we've had. 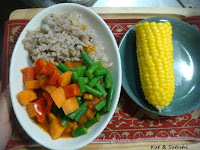 I served this with corn, some carrots, green beans, red bell pepper and rice. 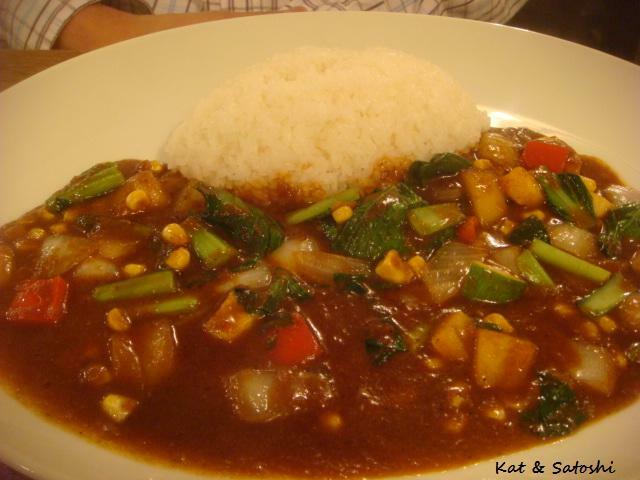 Satoshi liked the heat from this also and also mentioned that this curry wasn't as salty as some he's had. I can't wait to try some of the other recipes in his book. 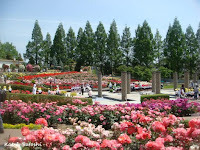 Wednesday, Satoshi had the day off so I packed some foods for our breakfast, and we headed to Aramaki Rose Park. 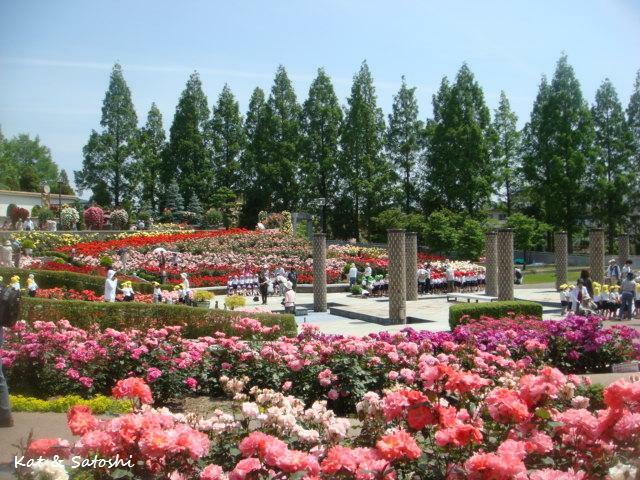 We love this place especially during Spring because the blooms are the most plentiful. 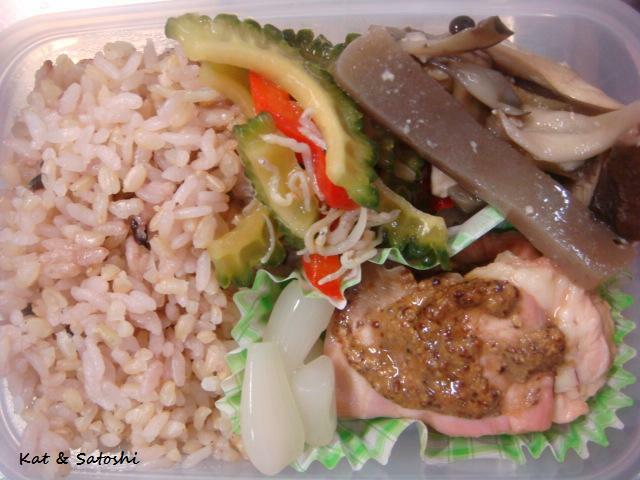 One item in our bento was this chicken which was really easy to make. NOTES: This was easy and delicious. Also in our bento was some goya kinpira, kinoko (mushroom) shigure-ni, a few rakkyo and rice. 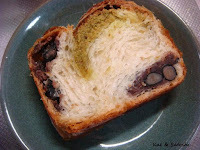 For the shigure-ni, I upped the amount of kinoko (mushrooms) and instead of beef, used konnyaku (jellied devil's tongue). I also packed some coffee in a thermos. 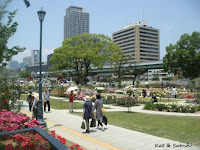 As with previous visits, the park was filled with lots of school children and elderly people. The flowers were in full bloom and every time the wind blew you could catch a "whiff" of the roses. 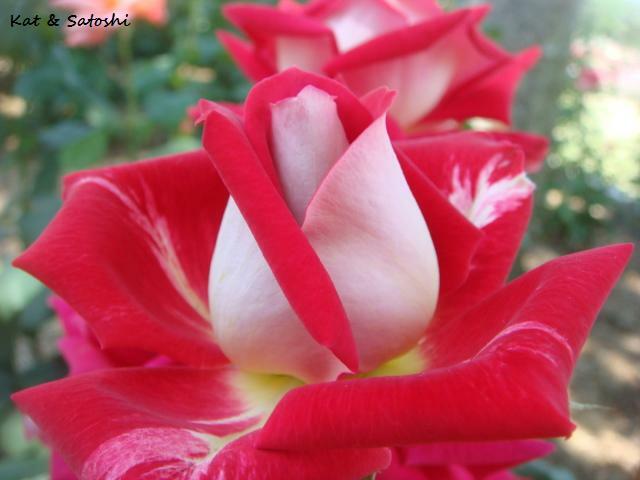 This particular rose was unusual and called "love". The weather is slowing warming up during the daytime and it was nice to get out and about. Monday I met up with my host-brother's wife, Kazumi. She had been wanting to check out some mexican food, so I suggested we go to Tacos el Nopal in Juso. Satoshi and I had eaten here previously but in the evening, so I was also interested in seeing what they served for lunch. Their lunch menu is limited. Choose from 5 entree items. 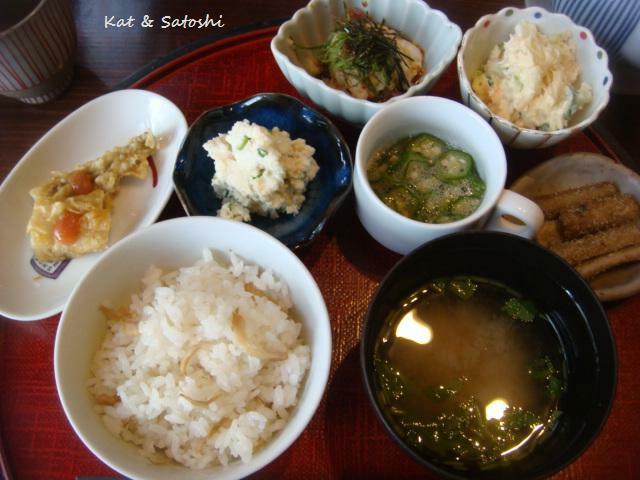 Your meal also comes with guacamole, soup & dessert...1000 yen. Kazumi chose the en tomatada, two small corn tortillas filled with chicken swimming in a tomato chili sauce and topped with queso fresco. I chose the burrito, a soft tortilla filled with chicken, beans, rice & cheese. We shared our entrees with each other and agreed they were both delicious though not spicy at all. 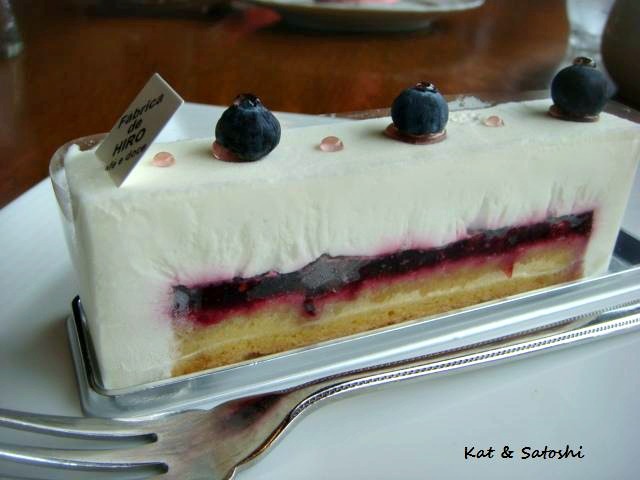 After lunch, Kazumi had some time before having to pick up her son, so we popped into Hamburg, a sweet shop. I had tried their sweets when they were in Daimaru Umeda, but since the renovation there, they are no longer selling their sweets there. 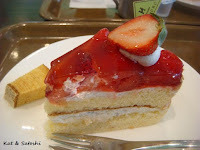 Kazumi tried their strawberry mont blanc and I had their "strawberry forest"....refreshing! It was a nice lunch and a great time. Mix well and top toast. 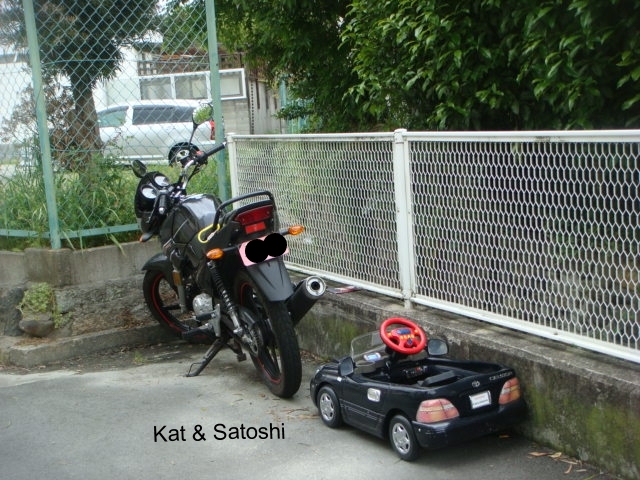 Satoshi thought it was delicious. It was good, though the tofu was a little softer than the egg. Tastewise you really couldn't tell tofu was in there. 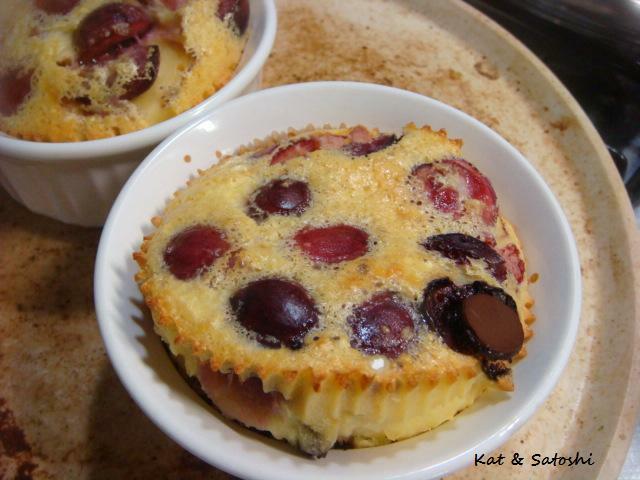 I am making this again. p.s. ooh and remember my motivator? well, I've been using it for a little over 2 years now and have hit 620 recorded miles!! whoo. 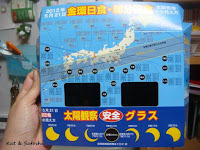 The kinkan nisshoku (annular eclipse) took place yesterday morning, during probably the busiest time of the day. I say busy because it is the prime time when people are going off to work & school. But by the time it actually started, the clouds started rolling in. Still, you could spot a few on their lanais checking it out. I didn't have a special lens or any type of large zoom lens for that matter, so this is the photo I got of the eclipse. Looking at it through the special glasses was way cooler, you couldn't even see the clouds using the glasses, I only wish I could've taken more photos to show you. 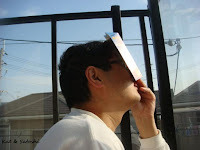 I did take a short video of looking at the eclipse through the glasses, it is a bit hard to see but I think you may be able to pick it out. 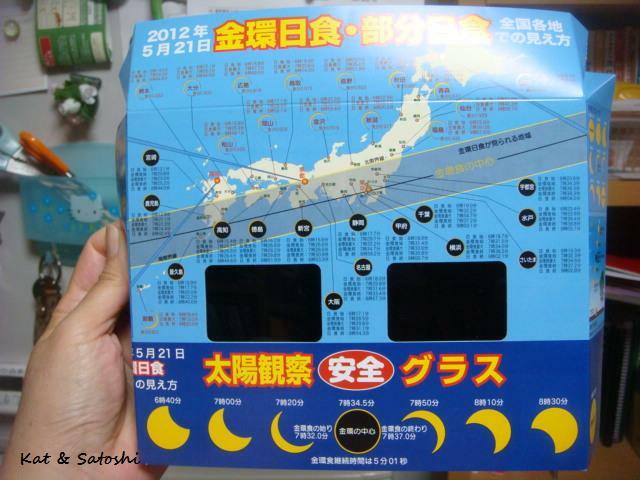 We're glad we got to see this, the last time that mainland Japan (Honshu) saw this type of eclipse was apparently 173 years ago and the next time it will occur again in Japan (Honshu) is 300 years from now. Even though I didn't get many good shots, I thought the clouds were kinda cool looking. The weather is still really cool especially during the early morning and evenings. The weather is also really weird, raining (even hailing in some areas)...eep! We still have our winter futon (comforters) out because of the weird weather, and May is half-over already! The beets I planted didn't fruit, so I dug them up and we ate the greens....yum! 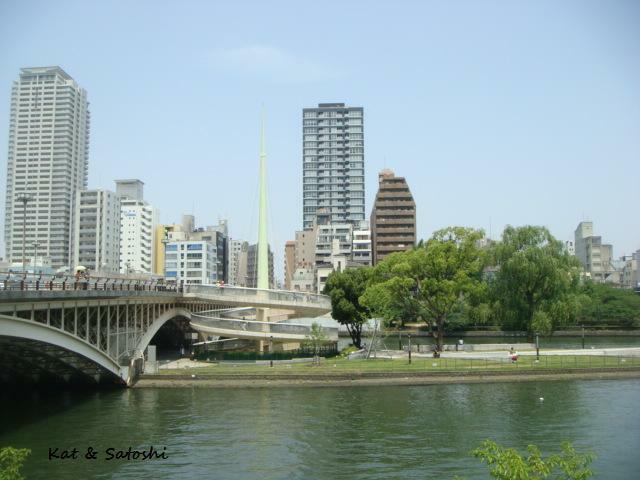 Minoh Beer's Yuzu White, won a gold at the World Beer Cup 2012 in the Fruit Wheat Beer category...way to go! Oh and there is supposed to be a solar eclipse this morning...hoping that the clouds will clear and let us view it, though the weather dude says otherwise...boo! 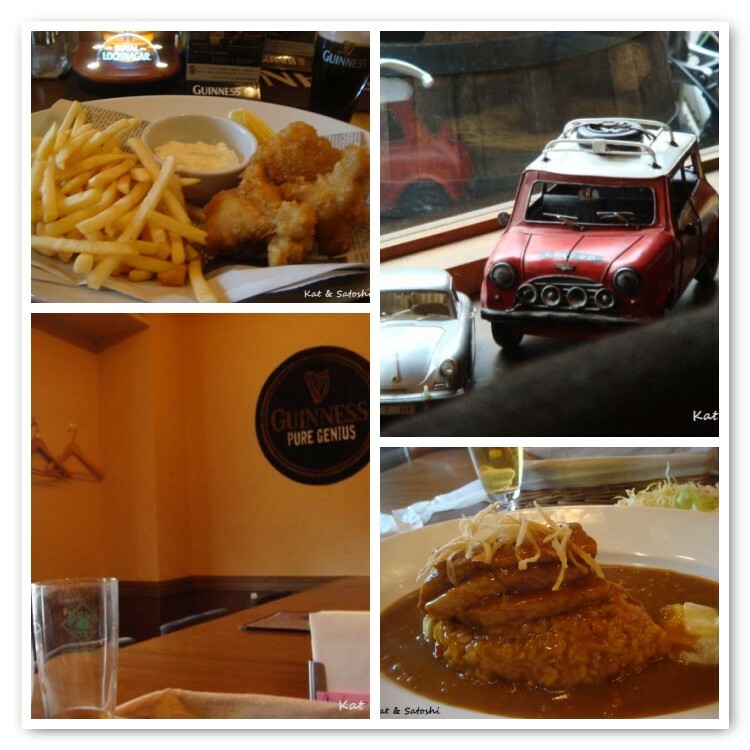 I recently received an email from Gerard, who told me about an eatery in Osaka called Irish Curry. 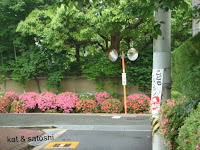 Since Satoshi had his German class, we went to check them out for dinner yesterday. When we got there at about 17:30, the place was filled. They only have counter seating so we had to wait awhile for seats to open up. 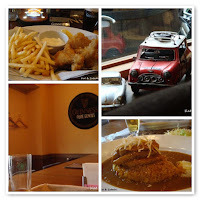 We shared the Irish Pork Curry...3 generous pieces of pork cooked until melt in the mouth tender in Guinness beer, then topped with a spicy Indian type of curry, and a little pickled cabbage...delicious. And it just wouldn't be right without trying their fish and chips...the fish are cooked perfectly, crisp on the outside and the fish is flaky on the inside. 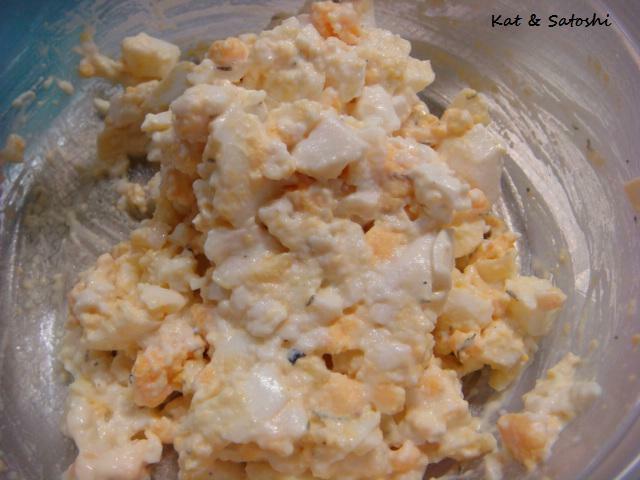 One note, the tartar sauce in Japan usually is more like egg salad, with chunks of hard boiled egg here and there, with not much relish or pickles in it. We also shared a salad. Thanks for a great tip, Gerard! We'll be back when we're near the area. 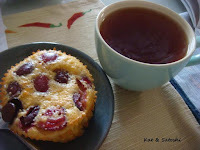 There is a tiny patisserie that opened up near our favorite cafe recently called Patisserie Y Style. Since I was in the middle of one of my walks, I picked up some items to try that didn't need refrigeration. 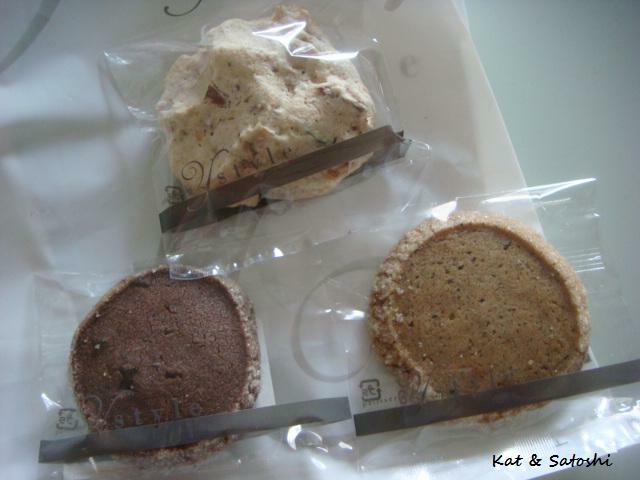 Their croquant (a meringue filled generously with hazelnuts & pistachios), chocolate sablé (very chocolatey), earl grey sablé (nice tea flavor). 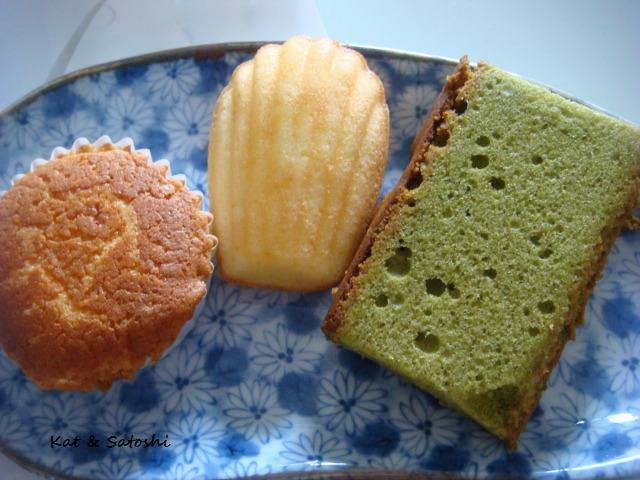 A rice flour madeleine filled with sweet black beans (very moist), madeleine (nice texture) and matcha poundcake (very nice matcha flavor). We really liked all of these. It's too bad this shop doesn't have a cafe area...We'll be back. Sorry it's been a little quiet here, we had an emergency over the weekend and everything has settled down now. 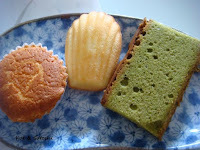 I wanted to share with you these biscuits (cookies) by MUJI. 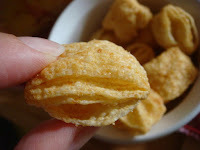 They are delicious but really HARD! They'll definitely give your jaw a workout. They had two kinds...one with chocolate & sesame and the other with 4 different types of dried fruits. It's Friday here, hope you have a great weekend. 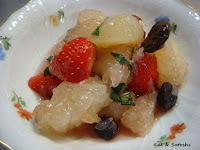 Remember the lavender scented fruit salad? Well, since I had made the full recipe of the syrup, I had leftovers of the syrup after the fruit salad, so I put a tablespoon of the syrup and then added some carbonated water to it. Goya was on sale the other day for 98 yen! 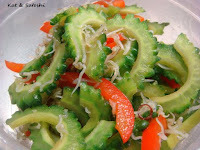 I used half of it with a fourth of a red bell pepper and some jakko to make kinpira using this recipe (minus the nuts). It was a little bitter, but I liked it. p.s. can you believe we still have cold weather?! oh and I received this red carnation from the lady at the yakitori kiosk for buying something....hope your mother's day was a nice one. 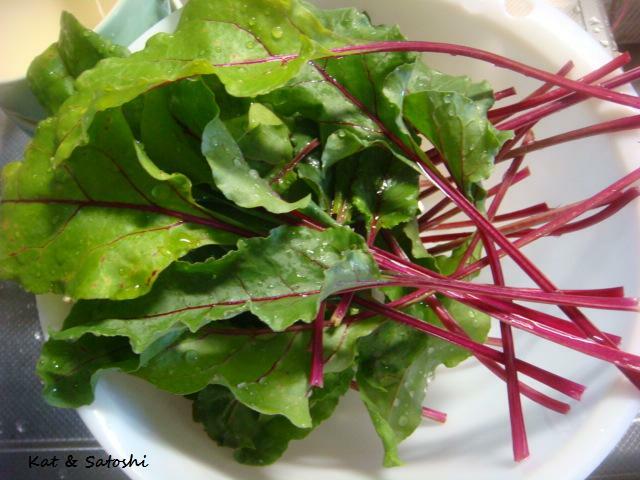 Having Okinawan ties, I am always interested in learning more about their food culture. On a recent television show, I learned about this dish...ninjin shirishiri (literally grated carrots). 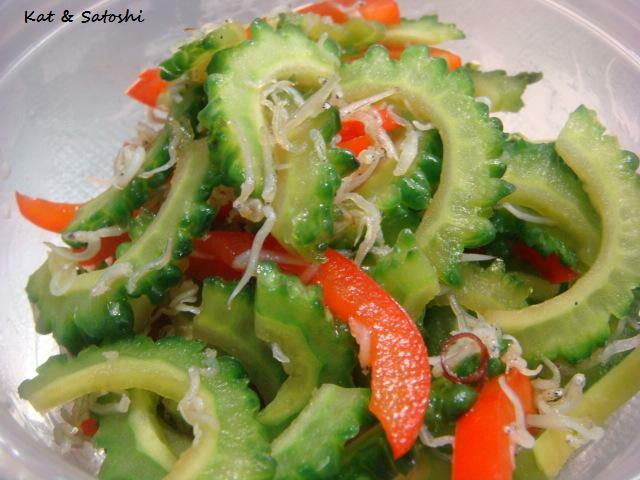 Shirishiri is the okinawan word for surisuri which means to grate. 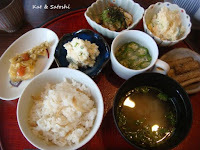 This dish is so easy to make, of course you can doctor it up with some salt or shoyu if it is too bland for you. In a heated pan, add some olive oil, then, add your carrots and toss them around. 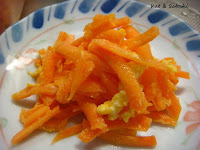 When they are cooked to the tenderness of your liking (I like mine almost raw), add the scrambled egg and try to coat all of the carrots with it. NOTES: This was so easy and delicious, perfect for a bento (boxed meal). I'm making this again. p.s. 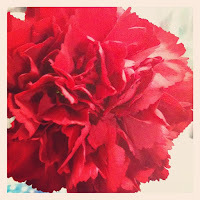 I want to wish all my "moms" out there a "Happy Mother's Day"
I've had this recipe bookmarked for awhile now. The reason I put summer in quotes is because this salad uses summer fruits like stone fruits (peaches, nectarines, plums) and berries (well, depending where you are). Well, by the time, the stone fruits are here, we won't have any berries in the markets, that is just how our fruits are sold here. On top of that, the white peaches in Japan are something you'd want to eat "as is", no extra additions to them, they are THAT good. 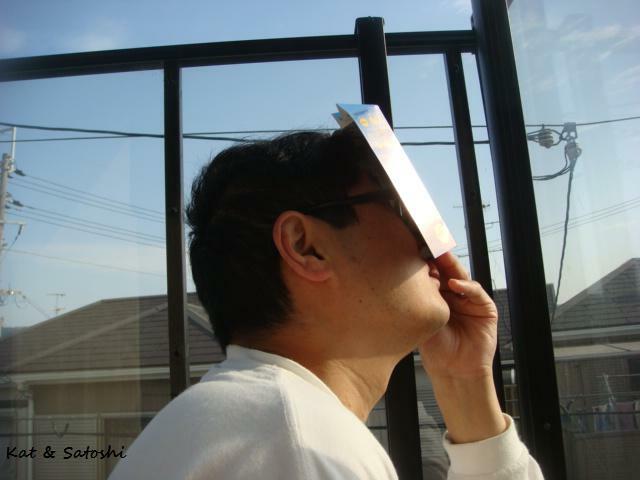 So, anyway, the weather was summer-ish on Thursday, and I thought, it was a good chance to try this. 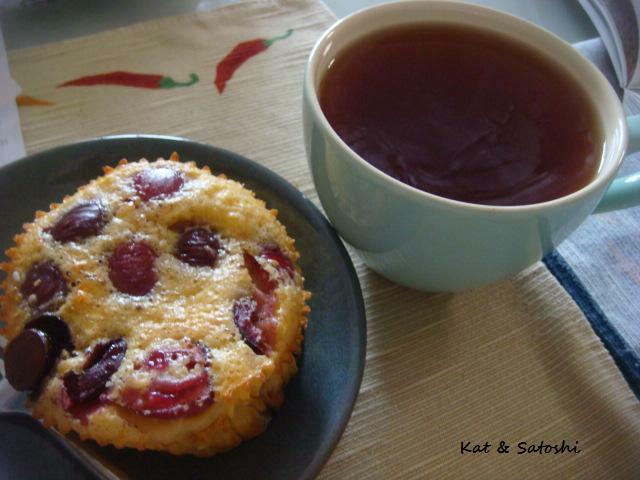 NOTES: I used 1 grapefruit, a handful of strawberries, handful of dried cherries & handful of dried blueberries. I think the blueberries and cherries made the syrup turn dark in color. 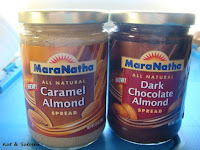 I made the full recipe for the syrup using agave nectar. When I tossed my salad, I only used 3 tablespoons of the syrup for my salad. I didn't have lime on hand, only 3 tiny sudachi, so I used that. 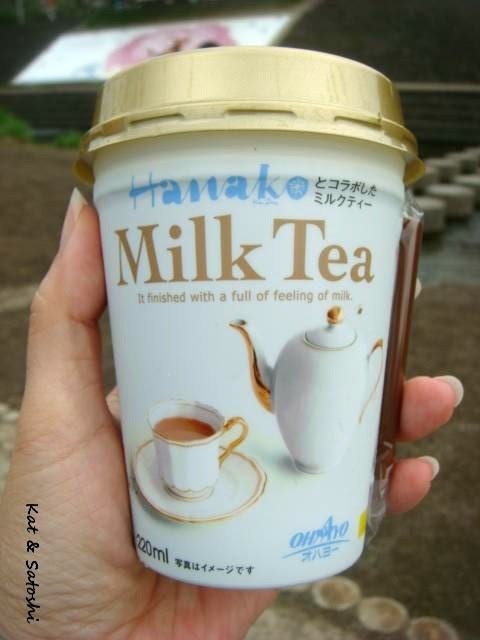 I liked the flavors, the lavender was present but not overpowering. p.s. so much for summer...we've hit a cold snap and our temps have dropped...brr! 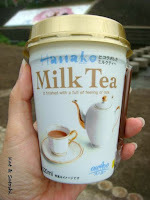 Starting with disliking...this milk tea, while I liked that they used earl grey, it was way too sweet. And I love Maranatha's products, but they use palm oil in these...that aside, these are still wonderful tasting. 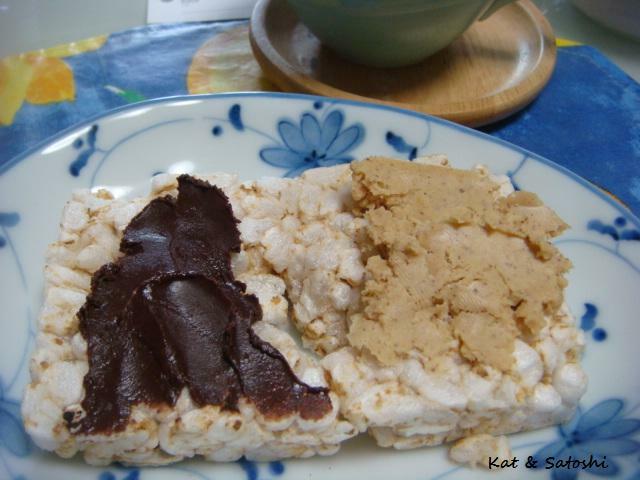 I put a schmear on puffed rice cake for a quick snack. Which brings me to the puffed rice cakes...I love these puffed rice cakes. 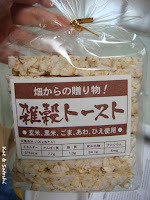 No additives in these, just puffed grains like millet, rice, sesame seeds & salt. This puffed snack, called Aerial, it tastes like Bugles, one of my FB friends said it looked like a huge Cap'n Crunch...it does. Giant Next by Glico, this is a drumstick type of ice cream with chocolate layers throughout. 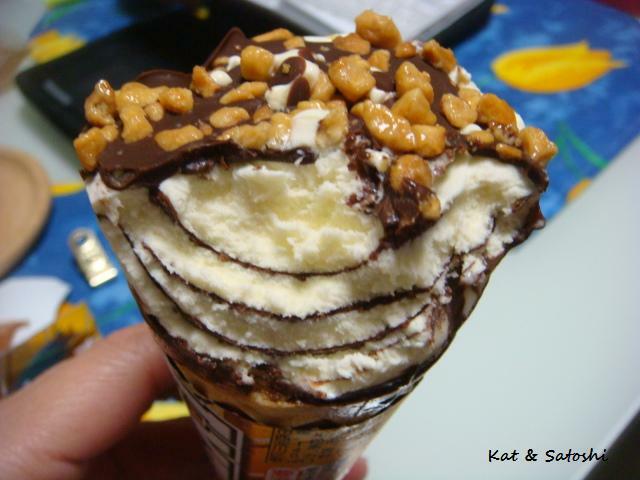 I love the Giant brand because they coat their cones with chocolate to prevent sogginess too. 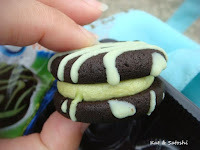 Oreo's uji matcha latte...Uji matcha is a "brand" of green tea, which comes from the Uji area of Kyoto...green tea cream sandwiched between two soft chocolate oreo cookies...yum! Ogura Sabo, a brioche type bread filled with sweet bean paste, black beans and a pistachio almond cream. I toasted this and didn't put anything on it. 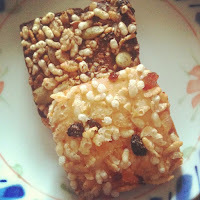 I liked the varying sweetness from the different ingredients. 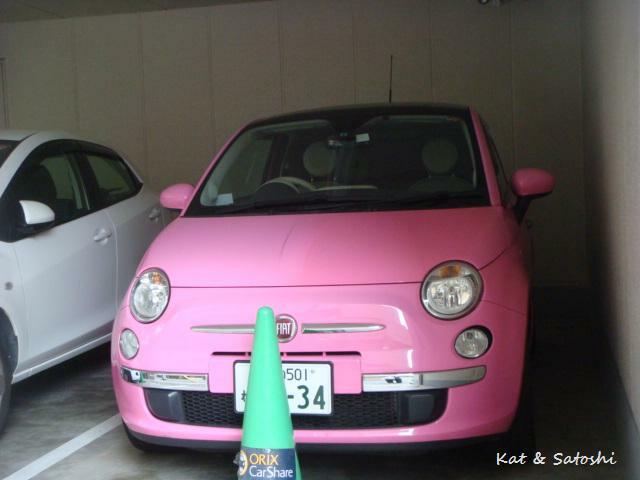 And lastly, how cute is this pink Fiat 500?! In Japan, you'll find something on menus called "dry curry". What you'll get when you order this is curry flavored fried rice. The other day I went to the market looking for my favorite curry roux, but they didn't have it (boo!). 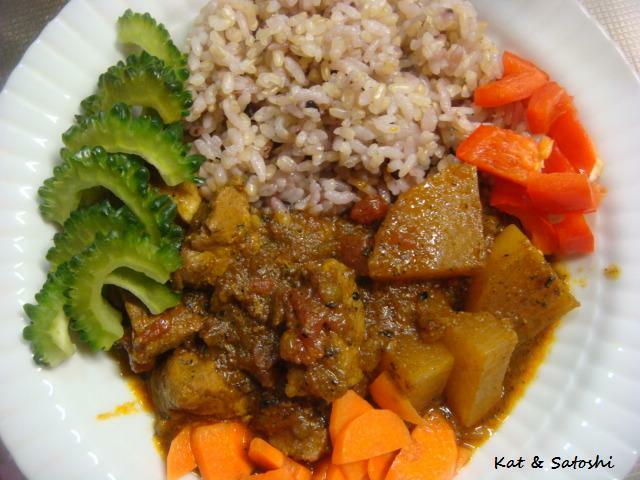 Still, I had envisioned making curry for dinner, so I decided to try something new. 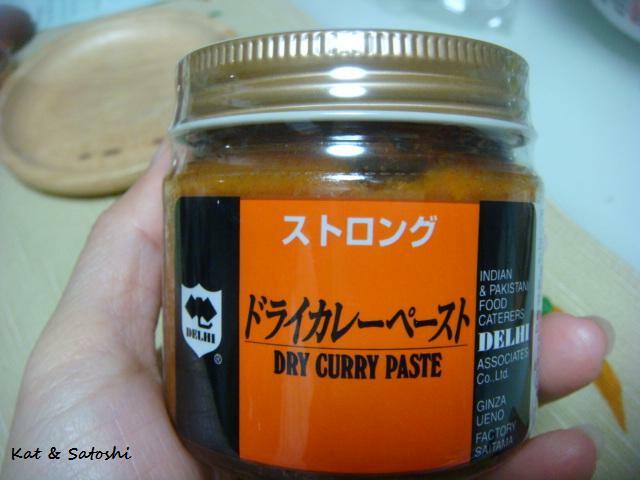 A bottle of "dry curry paste". I've known dry curry to be in powder form, but this was the first time for me to see it in a "wet" form. 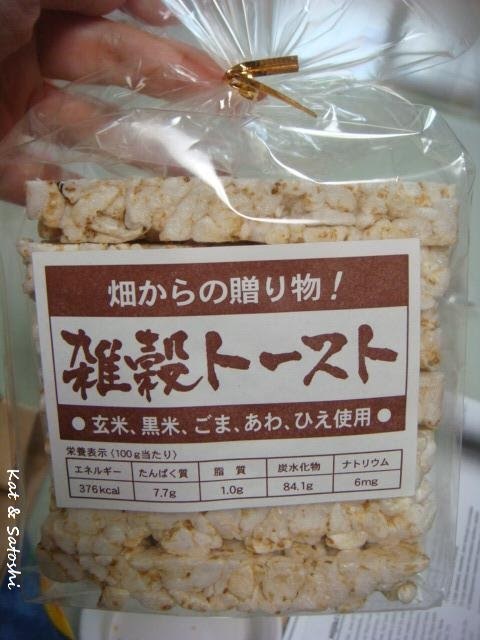 The directions on the bottle say to saute rice with a tablespoon of this paste. 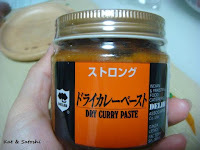 Besides the curry, there are carrots and some meat in the bottle. Instead, I cut up a potato, some spinach, some zucchini, onion and carrots. After sauteing these veggies, I added some tofu that I had sitting on a cheesecloth for about half an hour and a little rice. It isn't the most attractive dish, but it sure was delicious. The curry was spicy but not cough inducing hot. I guess I know what to use the next time my market doesn't have my favorite roux.